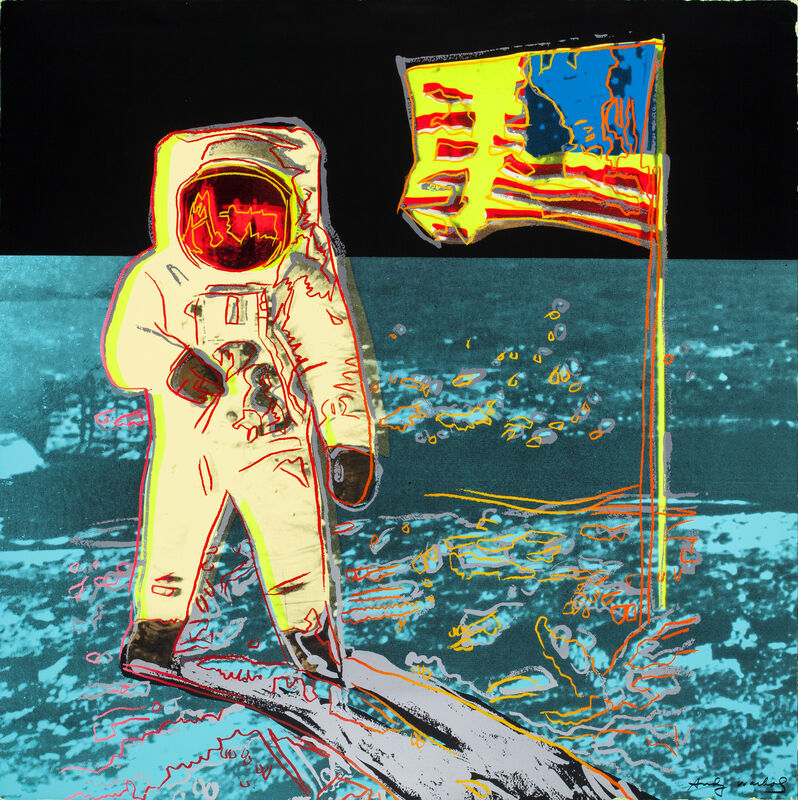 Moonwalk is one of Andy Warhol’s last works, produced shortly before his death in 1987 and never signed. There are two regular edition versions, one in yellow, one in pink. Andy Warhol – Moonwalk (1987). Yellow version. Andy Warhol – Moonwalk (1987). Pink version. Andy Warhol – Moonwalk (1987). 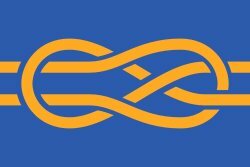 One of 66 trial proofs. It is easy to think that this is Warhol drawing and painting over a famous NASA photograph from Apollo 11, but this would only be partially true. 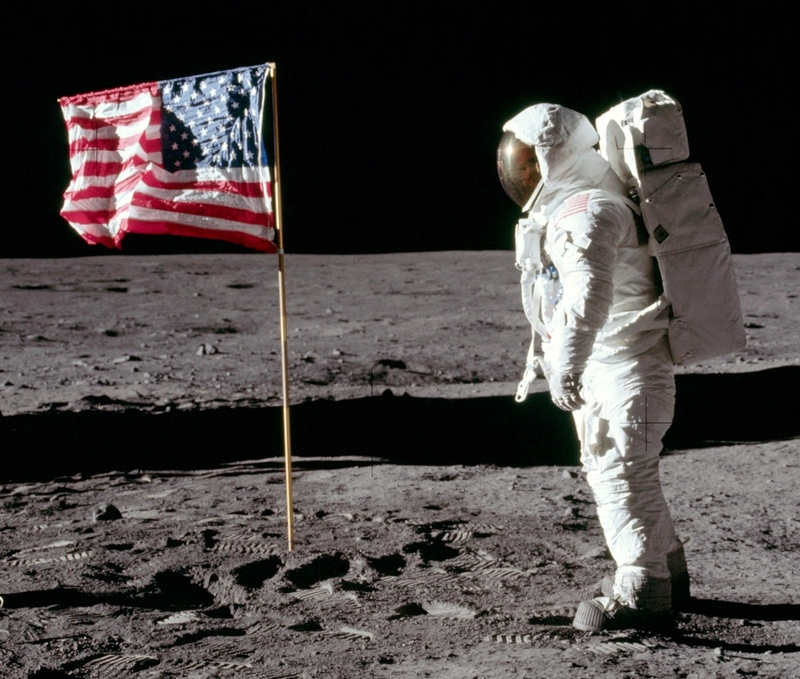 Neil Armstrong did take a famous picture of Buzz Aldrin standing next to the flag on the moon — but Aldrin is shown in profile, and to the right of the flag. Buzz Aldrin salutes the US flag on the Moon’s Sea of Tranquillity, landing site of Apollo 11, June 1969. Photograph by Neil Armstrong. Detail from photo AS11-40-5875 from the NASA’s Apollo 11 Image Library. 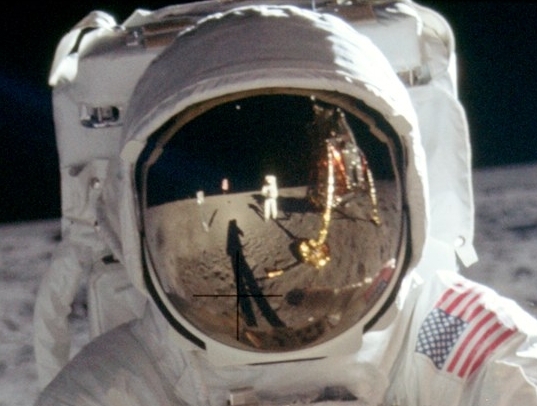 There is also a famous “selfie” that Armstrong took of himself, using the visor of Aldrin’s space suit as a mirror. This is in fact the astronaut photograph that Warhol used, but only after mirror-reversing it (e.g., in the photo the astronaut is bending his left arm, but Warhol’s astronaut is bending his right). 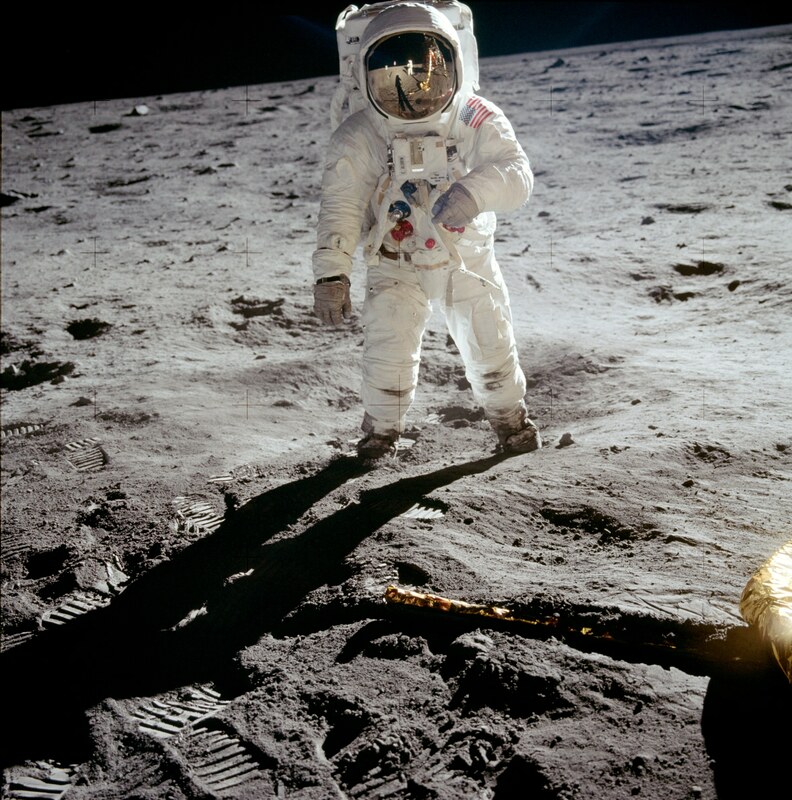 Buzz Aldrin on the moon, with Neil Armstrong and part of the Lunar Module “Eagle” reflected in Adrin’s visor. 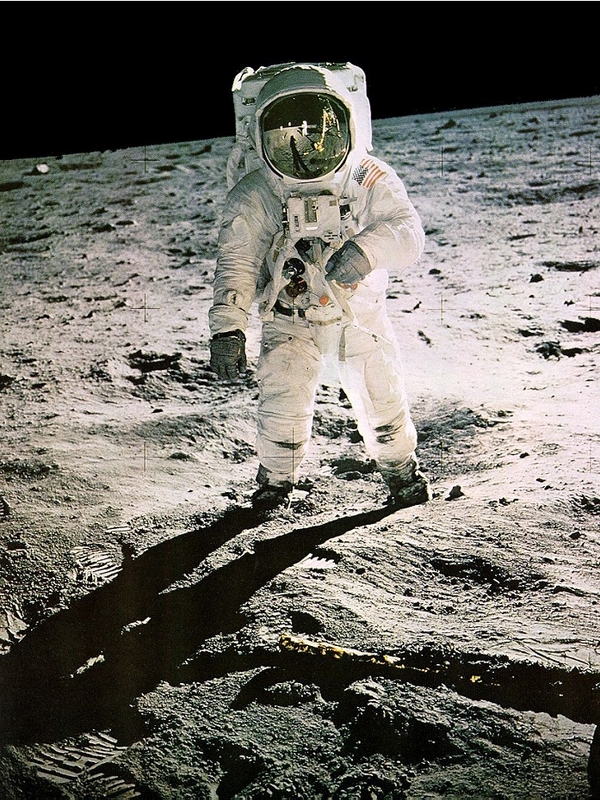 As a PR image that surely makes the moon landing deniers happy, this is actually a doctored image with black added above Aldrin’s head for aesthetic appeal. Apollo 11 image AS11-40-5903, version released to the press and featured, for example, in Life Magazine. So Moonwalk has behind it a story of artistic liberties, some taken by NASA, many more by the pop artist. 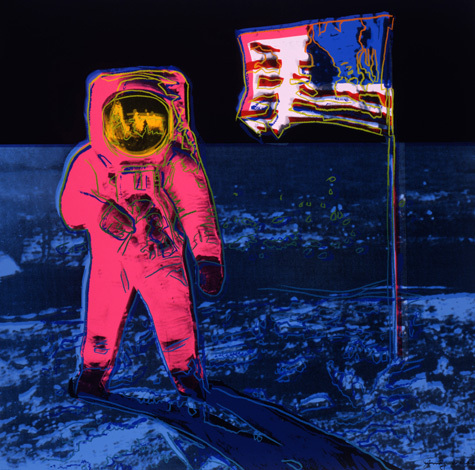 There is another story unfolding about this iconic flag image by Warhol/NASA. 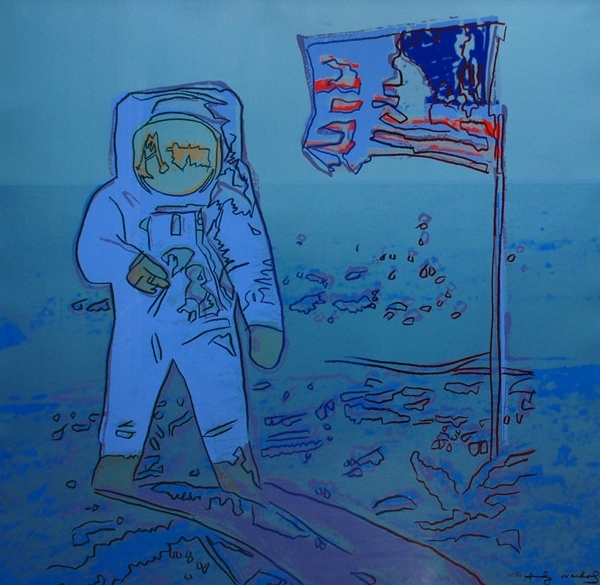 A year after Warhol’s death, Chris Murray’s Govinda Gallery donated Moonwalk screenprints to a charity auction for the Challenger Center for Space Science Education in Houston. 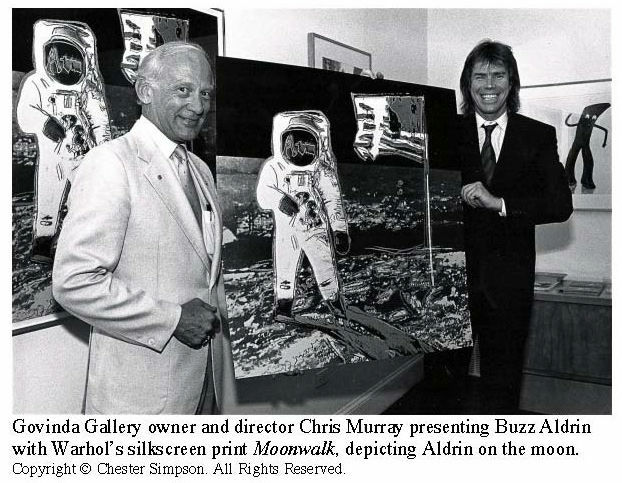 Aldrin and his wife Lois attended the event, and Murray ended up giving them one of the yellow screenprints. At the end of this month, Lois and Buzz Aldrin will be auctioning off their copy.